Irene Shaland presented her popular lecture “State of Deception: the Power of Nazi Propaganda” at the Maltz Museum of Jewish Heritage in conjunction with the Museum’s outstanding exhibit “State of Deception: the Power of Nazi Propaganda.” Irene based the slide show and narrative on her recent trip to Norway, Sweden, and Denmark. She conducted in-depth research of these countries’ past and present, and had arranged several interviews with Jewish leaders and lay people alike. 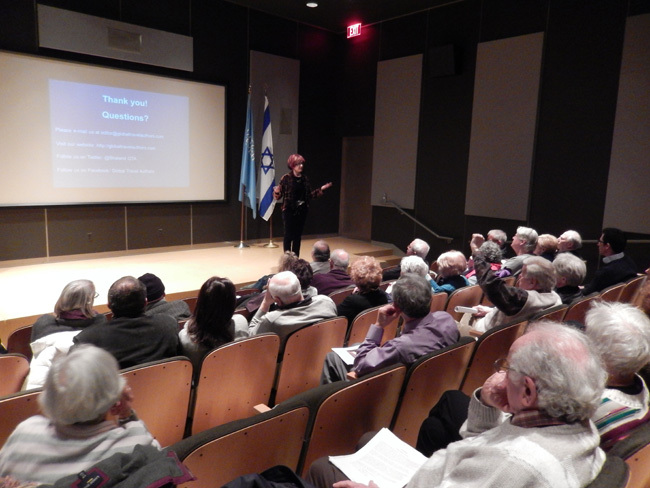 Well attended, this lecture attracted a diverse, captivated, and enthusiastic Cleveland audience. Irene would like to express her gratitude to Jeffery Allen, the Museum’s Director of Education and Public Programs, and Samantha Fryberger, Director of Marketing and Communications, for organizing this event. Read Irene’s Jewish stories from Europe, Asia, and Africa. This entry was posted in Europe, General, Jewish Story, Lecture and tagged Cleveland, Europe, history, Holocaust, Irene Shaland, jewish, lecture, Maltz Museum, scandinavia. Bookmark the permalink. The Presentation was wonderful. We learn a lot about Jewing Life in Norway, Sweden, and Denmark.Irene exposed us to the reality of Jewish life in that part of the world. It is amazing what these people have to put up with. Hopefully more lectures to follow as Irine and Alex are traveling the world. Countries made for terrific lecture. Add Irene’s captivating personality and you have a formula for success! All Irene’s lecture/presentations we attended always brought us feeling of great pleasure. Special thanks to Alex whose keen eye and steady hand with the camera bring all Irene’s emotions to life! It was really an enriching experience to listen to Irene & Alex Shaland’s presentation. Norway, Sweden and Denmark were shown to us from two vantage points: through the eyes of the presenters, and through the eyes of the Jews and non-Jews living in these countries. The lecture was very informative and moving. Thank you, Irene and Alex, for the great lecture! How many of us visit countries to delve deep into their history, their people, the geography, their architecture and design? Irene Shaland and her husband Alex, make every penny they spend on such visits worth it, not only for themselves but also for all those who attend their presentations following their visits. Irene not only captures the external details in finesse but also delves deep into the minds of the people, past, present and future, adding their emotions and real experiences, in order to make our experience of these countries surreal. It was as though Irene took me by my hand and showed me the intricacies behind each nook and corner of these countries. On that evening, in a little less than 2 hours, Irene and Alex traveled us through 3 countries Denmark, Norway and Sweden with such precision and detail, without we booking our air tickets or working for our hotel accommodations. “Scandinavia though the Eyes of a Jewish Traveler” was an exposition into the inner sufferings of Jews of those days, their resilience against odds, and their determination and grit to overcome crisis after crisis. Every frame was profound, touching and deeply engrossing. I’ve never seen anyone present with such confidence and thoroughness as Irene. The stories of the Vikings, Danes, Swedes and Norwegians, of King Christian V, followed by Christian VIII, the sad story of Raoul Gustaf Wallenberg and his courageous saving of tens of thousands of Jews from the Nazis, the descriptions of cities like Stockholm, Malmo, Oslo, and Copenhagen, and the poignant stories of some Jews who still continued to live there but waiting for their true freedom, were all touching and deep, bringing moments of sadness among the audience, who were drawn into rapt attention throughout. Alex was a perfect foil to Irene, as he elegantly drew a tapestry of images that caught the people’s imaginations well and blended seamlessly with the pathos that Irene laid out. Truly, the entire evening was an unforgettable experience, an experience the audience lived, not just heard and saw. This unique couple has immense talent and passion, to present the world to others in a most exquisite manner. 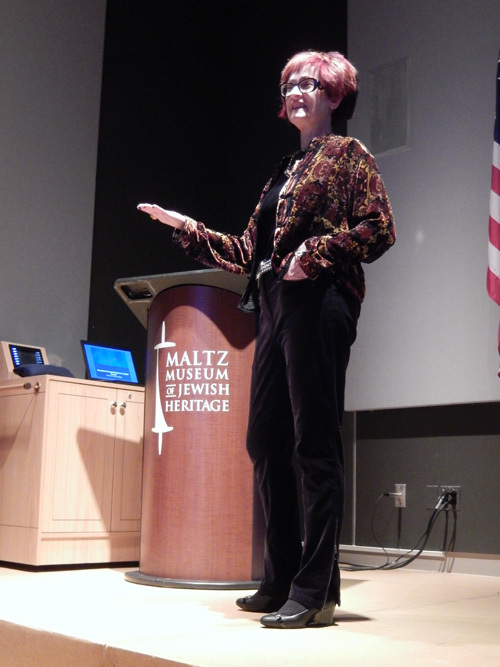 Dear Irene and Alex, Michael and I both greatly enjoyed your presentation at the Malts museum. It was very informative and interesting,like all of your lectures Wonderful, Fascinating, and Fantastic! We love to attend them.The research was incredible! Irene you are so talented! Alex did a great job with the wonderful pictures! We were captured by photography and Irene’s story of Denmark, Sweden Norway and the Jewish people’s lives, perspective then and now . Thank you again and looking forward to more adventures!! !